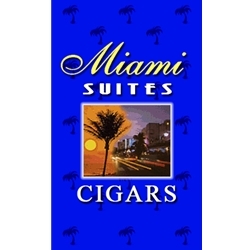 First introduced in 1998 Miami Suites machine made cigars are produces with a sweet and full of flavor taste that offers a mellow smoothness that's easy enough for any smoker looking for a relaxing smoke any time of day. Each of these machine made cigars are rolled in an exquisite Java wrapper from Indonesia that looks visually appealing. The filler is a blend of Caribbean-basin Cuban-seed tobaccos that facilitate an even and smooth burn. Here at Smokers Discounts, we’ve made it easy and affordable to buy machine made cigars online. Call us for more details!